Warding off those coffee shop cravings! 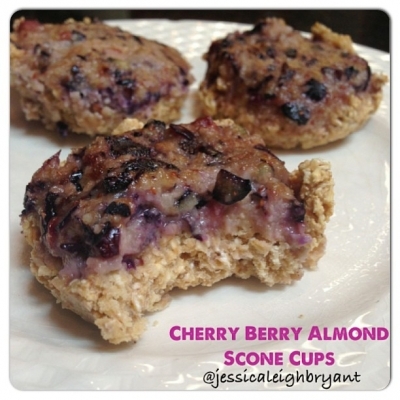 Scone: in a food processor, blend 1 1/2 cups rolled oats, 1 scoop vanilla whey, 1 tablespoon coconut oil, 1/2 cup almond milk, and 15 drops stevia extract. Roll into 1 1/2 inch balls and press into the bottom of oiled cupcake tins. Topping: blend 4 pitted cherries, 1/3 cup blueberries, 1 egg white, 1/4 cup almond meal, a dash of cinnamon, and 10 drops stevia. Spoon 1 tbsp of the mixture over the scones. Bake at 350 for 10-12 mins.